The Archeological Civic Museum of "Waters" is situeted in a beautiful building which stands at the beginning of Via Dante, in front of a XIX-century villa, (Villa Simoneschi), where there is the Town Library, just before the hystorical centre. The exibition is ranged in sections, where archeological remains coming from the town land are shown. Chianciano Terme stands on a hilltop overlooking to the west the fertile Chiana valley, already mentioned by Latin authors for its varied and abundant crops. In the vicinities of the present Chianciano, close to the ancient road that connected Northern Etruria's inland to the coast, a rather sizeable Etruscan settlement must have developed that controlled this important route running through the Astrone valley.The presence of warm healing springs in the area must also have played a role in the development of the Etruscan Chianciano, since the area was a centre of the cult worship of Apollo as early as the 5th century B.C. The cult of Diana-Selene developed in the area during the Hellenistic period (3rd -2nd centuries B.C) .Near the springs remains of imposing bronze statues belonging to a sacred building were unearthed last century and more recently traces of another temple were found not far from the hot spring of Fucoli. 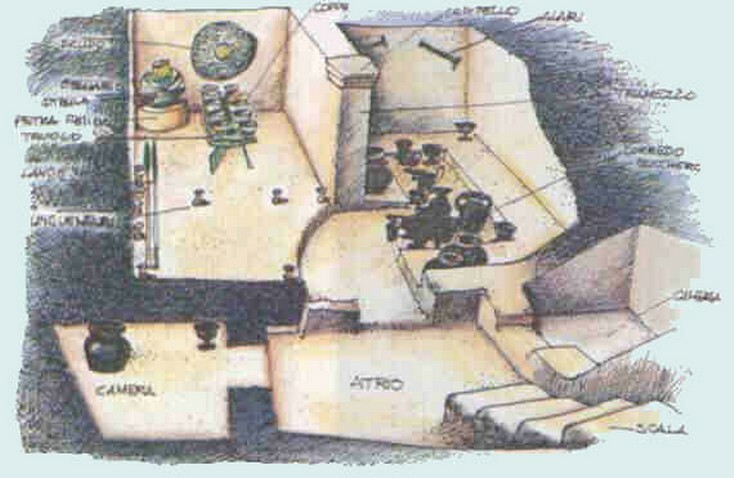 This recovery suggests that the building of temples were linked to the existance of healing springs in the nearby.The necropolises discovered in the hills around Chianciano testify to the wealth of their owners; in the graves numerous buccherowares and Attic ceramics have been recovered as well as bronze vases and precious alabaster cinerary urns.The tombs also revealed the gorgeous cinerary statue, the Mater Matuta, that represents Motherhood, and the cinerary urn whose lid bears the effigy of the deceased accompanied by a winged goddess holding the scroll of destiny in her hand. Both items are made of "pietra fetida", the local limestone that gets its name from the unpleasant odour that it gives off when being carved. Sensational discoveries, made in the area over the past few years, have focused archeologists’ attention on Chianciano Terme. In 1986, for example, remains of a monumental terra-cotta frontal were recovered at a short distance from the spring at Fucoli The frontal dates from the 2nd century B.C. and is decorated with highly-accomplished terra-cotta figures, 2/3 of life-size. In more recent years systematic excavations in the necropolis at La Pedata have brought to light about twenty tombs: one of these was decorated with a valuable carved ceiling. Most of the tombs excavated had already been pillaged during the past century: some others still contained part of their furnishings. One tomb, though, escaped the 19-century despoliation and revealed a remarkable set of vessels. This tomb has been rebuilt inside the Museum. A detailed description of it will follow further on. The "Delle Acque"Civic Museum of Archaeology at Chianciano Terme is housed in an elegant late 19th-century building in via Dante, immediately before Chianciano old town, opposite to the Civic Library . The museum has been arranged in three sections, each containing materials from the different historic phases of Chianciano's territory. The first section of the museum (ground floor) contains items from the graveyard at La Pedata, the most important and widespread necropolis of both territories of Chianciano and Chiusi It is set on the northern slope of the Astrone valley, along an ancient route that, through the Orcia and the Ombrone valleys, linked the Etruscan town of Chiusi to the Tyrrhenian coast. Other graveyards are located at Morelli, Morellino and Le Piane. The tombs at Morelli turned out to be the most ancient, dating back to the last decades of the 7th century B. C.; nearby items from Roman age were recovered as well, and more recently tombs belonging to the archaic and classic period were found that contained bucchero vases, Etruscan-Corinthian pottery, miniature vases etc. In 1995 a sensational discovery was made in the graveyard at Morelli: a prince tomb was of the Orientalist phase (7th century B.C.) was found still intact along with its precious contents.. The tomb has been rebuilt life size in this first section of the Museum. Also the burial furnishings have been replaced as they were when discovered. This tomb was located along the southern side of the old Vecchia Senese road It was presumably topped by a tumulus that was destroyed by agricultural work. The tomb consisted of an atrium flanked by small chambers already plundered. Beyond the atrium, at the far end of the tomb was a rectangular chamber divided into two by a partition wall. A column must have stood before the partion. Archeaologists have recovered only the capital of it. The unsteady ground, in which the tomb was excavated, and the weight of its stone roof, caused it to collapse thus sealing the chamber and its precious contents. The tomb's rich burial furnishing included a globe-shaped canop (ossuary with anthropomorphic characteristics) made out of a sole bronze layer. On the vase lid covered with gold leaf were two eyes made of bone and amber.In front of the canop stood a little low rectangular table ( the trapeza) made up of a subtile bronze layer, finely decorated with phytomorphic and zoomorfic motifs of Orientalising taste. On the table stood ten bronze vases, six beakers and four drinking cups, the latter having the rims decorated with a perl string. A bronze shield with geometric carvings lay behind the canop. Thirty bucchero vases lay to the right of the partion wall. The first section houses also burial furnishings from other tombs. Of great interest is the furnishing coming from the tomb n. 20 at La pedata. It contains a complete set of bucchero banquet vessels,some of them bearing unusual red and white paint decorations: The set included an Attic Kylix (wine-bowl) bearing on the inner side the picture of a rooster and on the outer side an inscription in Greek, meaning "health and drink". The exibit of Chianciano necropoles’ items continues in the basement of the Museum. Here, inside the five show-cases carved out in the walls, items recovered in the necropolis at Tolle, near the path La foce, are displayed.The excavations carried out by the Museum in 1996 in this necropolis brought to light eighty graves, the most part of which being small chamber-tombs or dead-pits; rarely the graves contained the dead. Most tombs of this necropolis date from the 7th century B. C but there are also examples from the end of the 6th century as well as from the late 3rd century B.C.The extent of the necropolis and the amount of findings so far recovered testify to the existance of a powerful and rich oligarchy that had gained control of the mountain pass at La Foce, through which the road leading to the coast ran. The adjoining room contains donations made to the Museum by private citizens Foremost amongst these donations is the Terrosi collection, comprising items coming mainly from coastal Southern Etruria sites and especially from Vulci’s territory. Very few items of this collection come from Chianciano’s necropoles.The collection’s core consists of a number of valuable Attic ceramics and a group of Etruscan jewels dating back to the Orientalist and archaic phase. Remarkable for the high standard of design is a blackfigured drinking cup with figure of a deer grazing between two sirens. There are also a big .amphora.with Hercules fighting against the Amazons and a gorgeous redfigured Stamnos on which the myth of Tetide's kidnapping is depicted. On the main side of the vessel Peleo is represented while kidnapping the goddess, on the other side the Nereids scared gather around their father Nereo. Among Etruscan pottery, beside some bucchero vases, are two Etruscan-Corinthian olpai and a fine amphora with figure of young men racing (Vulci 6th century B.C.). Less valuable, but of considerable historical interest for Chainciano's territory, are finds donated by Marcello Palazzi, most of them coming from the area of Mount Cetona and Sarteano.The collection includes numbers of sherds and bowls coming from the area of Belverde; two ossuaries, several little impasto vases, some bucchero wares, few examples of glazed ceramic and some bronze fibulas recovered in the plundered necropoles of Solaia and Aiola. On dislay there are also finds recovered by Mr.Secchi-Tarugi during an excavation campaign in 1960s, at Casa al Vento, between Montepulciano and Chianciano. In two deep wells in a lot already explored in the past century, he found bronze statuettes from the 2nd century B.C., sherds of antefixes, a Sylenus mask, many black-glazed ceramics and loom weights..
Another small group of objects come from Mrs. Casini's collection: a fine bronze handle from Chianciano's area and the stamnos jar with cylinder decoration. The second section of the Museum, on the first floor, contains a reconstruction of two rooms of the late-Etruscan farmhouse (3th-2nd centuries B.C. ).of Poggio Bacherina, a couple of miles out of Chianciano Terme.The farm was destined for the production and conservation of wine that was contained inside large jars (dolia) lined up along the walls of the wine cellar that is located on the northern side of the settlement, as the ancient agricultural sources advised, since the cold northern winds favoured a better conservation. Excavations near the healing spring of Fucoli have made it possible to recover several statues and remains of a frontal. that decorated a sacred building made of perishable material, perhaps dedicated to a divinity connected with the nearby spring. The frontal has been reconstructed in the upper rooms of the Museum. A wonderful acroterion decorated the right edge of the frontal. The acroterion consists of a winged female figure.The figure is depicted as she is flying up. She holds a Kantharos in her left hand, and keeps the right hand close to her face as if she were scared or surprised. In the show-cases several objects of worship from the same building are displayed. There’s also a splendid male bust (2nd century B.C) found near the Fucoli spring. The third and last section of the Museum houses finds coming from the Roman monuments in Chianciano, among which there’s the large cistern known as " Le Camerelle". Other interesting items come from Mezzomiglio, right in the middle of Chianciano terme, where a sizeable thermal structure dating from the 2nd century B.C is being excavated by the students of the University of Arizons.